What if Disney World was overrun by Gotham's ladies? 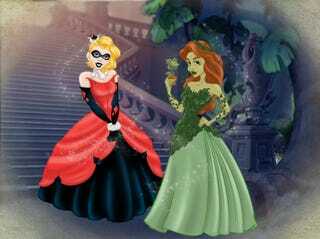 Behold Harley Quinn, Poison Ivy, and Catwoman in Disneyified garb. I kind of love that Catwoman appears to be holding jewelry she presumably nipped from Pocahontas and Ariel. All of the images come to use courtesy of Deviant Artist Cat Londers.